Happy new year! I hope your Christmas was fab and sparkly and largely devoid of familial melt downs. I was really crap in December and didn’t write any blogs because Christmas totally got the better of me and acting as Willow’s social secretary was bloody exhausting (but super fun). So sorry about that but I’m back now and feeling refreshed – kind of. I’m still sweating Brie and Baileys. Does that count as a New Year de-tox? Deffo. 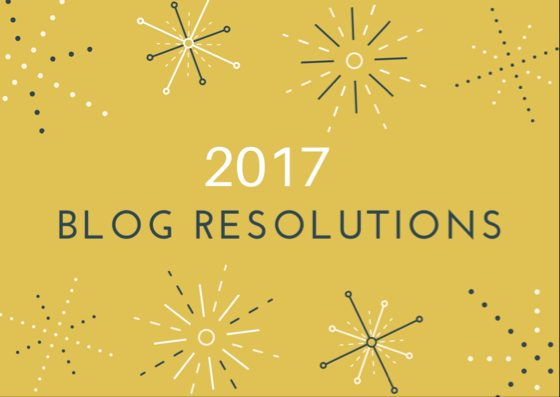 Anyway, I’m writing down my blogging ‘resolutions’ for 2017 and expect you all to hold me to them. Please feel free to give me a virtual kick if you think I’m slacking. Manage my time better. I work full time so have been trying to write in the evenings when I’m usually tired and not at my creative best. This year I’m going to try and set aside some time at weekends (subject to negotiations with Anthony) to see if this suits me better. Go with the writing flow. I work in communications where content is drafted, reviewed, redrafted and signed off before being published. I’ve been applying this mind set to my blog but I think I just need to go with the flow a bit more. Nobody is expecting it to be perfect, I’m not going for a Pulitzer for Christ’s sake! This should help me with time management too. Work on my brand. I’ve been playing around with some of the free apps out there to create a logo. Having a consistent logo and theme will help make my blog more recognisable and searchable so this is definitely high on my to do list. Link up my social media accounts. I’m obsessed with Instagram but I know I need to spend more time on my Twitter and Facebook pages too. Take part in more Linkys. I started to do this towards the end of last year and really enjoyed discovering new blogs and interacting with other bloggers but it is time consuming. I’ve decided the answer is to try and get away from my desk at lunch times to take part – Lunch time Linkys! Go to a blogging event. If you’re thinking of going to one and want a buddy, give me a shout! Pay off my credit card. OK I know this isn’t related to my blog but I really need to get on top of this shiz so I’m writing it down in as many places as possible…. Most of all I just want to continue to enjoy writing and not put myself under pressure . There are times when family life means I’m too busy or I’m just genuinely dog tired but that’s ok. I’m sure you all understand this and will let me (and each other) off once in a while. Any advice or help on the above would be received with a million squishes (non negotiable). Next Post Under the sea…..
hehe your comment on Pulitzer award made me chuckle. I work in marketing and everything gets reviewed and edited to the nth degree. I know what you mean! I’m my own worst enemy!